Anyone under probation is required to take the drug test. This is a common practice in County Probation, Federal Probation, and Drug Courts. The legislators are always under the impression that the criminal drug users’ remain addicted and continue using drugs even through the cycle of court, probation systems, corrections, etc. Also, there are chances that the criminal might still be committing crimes or breaking laws to serve his/her addiction. Probation and drug courts drug testing can prove to be an act towards preventing the use of such illegal drugs. 1960 was the year when Probation Drug Testing started with the primary purpose of identifying addicted drug abusers, and to help them, treat them and keep an eye on their progress. The frequency of conducting the test may vary upon your relation with and image in front of the officer. If you are someone who holds a record and are always suspected of drug abuse, you might be tested more often than others. It is necessary that you understand that probation is the result of a plea deal and that if you maintain a good image, stand by the guidelines and stop drug abuse, there are chances that you can rebuild the trust, and it might work in your favor. What Test Will Be Required? A standard 12-panel urine drug test is conducted that identifies up to 12 types of legal and illegal drugs. Urine tests are the most inexpensive and effective method of testing for drug abuse. The test is capable of detecting nearly any drug present in the body. One of the most important advantages of conducting a urine test is that the results can be known immediately and one does not have to wait for days for the results. The best way to conduct safe and effective drug testing in probation and drug courts facilities is by ordering these cups in bulk, and then going about it. Ovus Medical is a company that produces high-quality urine drug testing cups that can effectively test for up to 12 drugs in one go, under five minutes. These cups are tightly secured and are precise in results. To conduct the test, all you have to do is collect the sample in the cup, tightly secure the lid and leave for about five minutes for it to show the test results. If the cup shows a red line that means the test has been conducted successfully. This red line appears within 2 minutes of the test being taken. You have to wait for at least five minutes to see the results. If another red line appears, that means the test has been negative. If no other line appears even after five minutes, the test results are positive. The cups come with an instruction leaflet to help you with the procedure of carrying out the test and identifying the results. 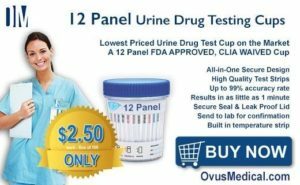 You can place a bulk order of drug testing cups with Ovus Medical at the most affordable prices.